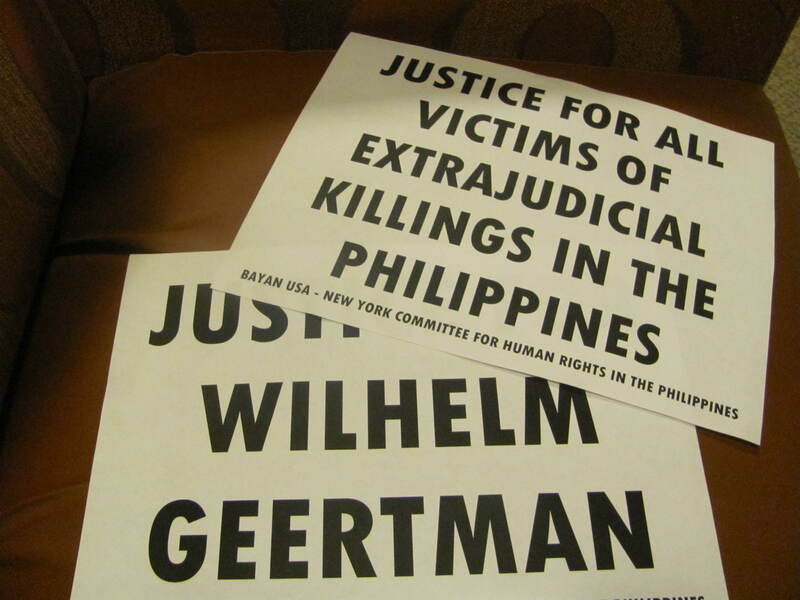 July 9, Jersey City, NJ- The New York Committee for Human Rights in the Philippines (NYCHRP) hosted a memorial for the late Wilhelminus “Willem” Geertman. Geertman was a 67-year old, Dutch development worker who was brutally killed by two men on a motorcycle on July 3, 2012 in Angeles City, Philippines. “NYCHRP denounces Geertman’s death, because it is the latest assassination by the Aquino administration,” said Gary Labao, member of the organization. Since the start of the Aquino regime, there have been almost 100 extra-judicial killings of peace activists. In the case of Willem Geertman, evidence gathered by cause-oriented organizations clearly show that Geertman was killed by elements of the military for his progressive work amongst the poor and oppressed rural communities in the Philippines. Geertman had been in the Philippines for 46 years, tirelessly serving and fighting for the rights and welfare of the indigenous Dumagat-Aeta in the province of Aurora, Central Luzon. He was an integral part of setting up an organization of the indigenous people living in the deep forests of the Sierra Madre in Aurora province. Geertman was also an active and devoted environmental activist who campaigned against large-scale mining and logging in Pampanga and Zambales provinces. He also fought for land reform for farm workers in Hacienda Luisita which is owned by the family of President Benigno Aquino III. “Geertman is the 17th environmental activist to be slain under Aquino simply because he worked with local communities around anti-logging and anti-mining issues,” Labao further explained. Geertman’s death bears striking similarities to the assassination of 59-year-old Father Fausto “Pops” Tentorio. Tenorio was the Italian missionary who had been serving an oppressed, rural community in Mindanao, and was slain less than a year ago by suspected elements of the Philippine military. Members of NYCHRP and allied BAYAN USA organizations grieve for Geertman’s family. The Filipino broad masses who knew and deeply loved him will always consider him an immutable defender of their rights. NYCHRP calls on all concerned and progressive Filipino and solidarity organizations and individuals to continue to demand justice for Willem Geertman! Justice for Wihelminus “Willem” Geertman! Next Post Mon, 7/23: Join BAYAN USA for The 2012 PEOPLE’S SONA IN NYC!